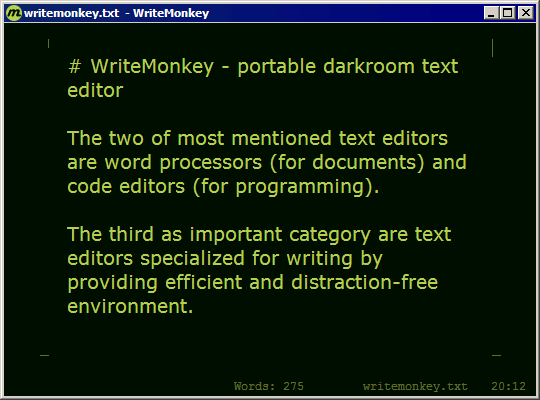 The two of most mentioned text editors are word processors (for documents) and code editors (for programming). The third as important category are text editors specialized for writing by providing efficient and distraction-free environment. I’ve been keeping an eye open for alternative to Q10 editor (nice, but not actively developed) and recently got to trying out WriteMonkey. keyboard-centric experience for rapid and productive typing. It also extends these with many original functions, such as focus on specific section of text and bookmarking/jumping. Aside from nice overall experience I like most that WriteMonkey can seamlessly export text to HTML. You have to use Markdown or Textile syntax for markup, but they are easy enough. You can even hook your own CSS templates to get ready to use page instantly. There are also plenty of pre-filled plus customizable features, such as text replacement and looking up selection at online resources. There is also export to Microsoft Word. Which I don’t use at home and testing this feature with OpenOffice was slightly disappointing. Markup was preserved, but all text reset to single font and size. Dull. Excellent editor for writing that packs a lot of functionality but still puts calm and productive experience first. Works without installation (requires .NET Framework installed) but don’t forget to create profile to not leave settings behind.